The Comfort Women Justice Coalition issued the following statement on Jan. 31. “Grandma Bok-Dong Kim, a human rights activist and survivor of the Japanese military sexual slavery, euphemistically called the ‘comfort women,’ died on Jan. 28 (local time) in Korea. She was 93. “We are deeply saddened by this news. For the last 20 years, Grandma Kim demonstrated every Wednesday at the ‘comfort women” memorial in front of the Japanese Consulate in Seoul. 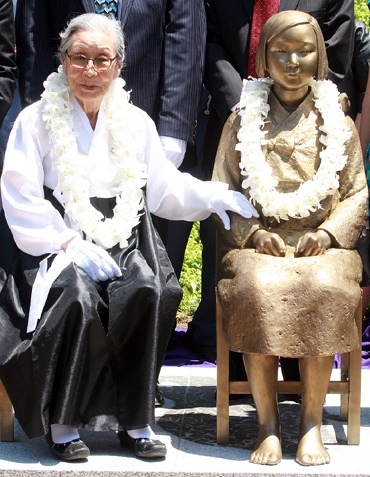 She is familiar in the U.S. as she has flown twice to Glendale, Calif. to advocate for the successful building of the ‘comfort women’ memorial in Glendale. “She spoke out most strongly against the 2015 now-defunct agreement between the former President Park Guern-Hae government and Prime Minister [Shinzo] Abe of Japan. She even sued Park’s government, as one of 12 ‘comfort women’ victims and plaintiffs, demanding the South Korean government withdraw from the 2015 agreement and pay reparation to each of the CW survivors for 1 billion yen. In Seoul, South Korean President Moon Jae In visited a funeral home to pay his respects. He said via Facebook that thanks to Kim’s testimony, South Koreans were emboldened to face true history. After coming to power in 2017, the Moon administration revisited the comfort women agreement and concluded that it could not settle the long-standing issue as it did not reflect the opinions of the surviving victims. In November, South Korea decided to dissolve a Japanese-funded foundation that had been set up to disburse money to 34 former comfort women and the relatives of 58 who have already died. There are 23 women alive today whom the South Korean government recognizes as former comfort women. The Glendale City Council adjourned on Jan. 29 in Kim’s memory. Memorial gatherings were held on Feb. 3 at the comfort women monuments in Glendale’s Central Park and San Francisco’s St. Mary’s Square. Kim attended the dedication of the Glendale monument in 2013. Representatives of Nikkei for Civil Rights & Redress were among about 70 people taking part in the Glendale ceremony. Like the monument in Seoul, the Glendale monument features a statue of a Korean girl sitting in a chair. The San Francisco monument consists of statues of three young women representing victims from Korea, China and the Phlippines, and an older woman representing the survivors. To protest the latter monument, Osaka ended its sister-city relationship with San Francisco.